The Air Force's safety specialists are charged with preventing mishaps on Air Force bases, that is, minor safety violations or accidents that affect the well-being of its personnel and civilians. They plan, organize, direct and control safety activities as directed by superior officers, and analyze any trends to assess risk and create preventive programs. And in some instances, they may provide training or instruction in line with Air Force and Department of Defense protocols. The Air Force categorizes this job as Air Force Specialty Code (AFSC) 1S0X1. In addition to planning and organizing safety activities, these airmen develop policies and procedures for implementing and evaluating safety programs. They coordinate across departments to ensure safety requirements are not just followed but integrated into departments' organization. They also serve as liaisons with federal, state, municipal and private agencies to coordinate safety concerns and plans and share best practices for implementing safety programs. It's up to them to establish work priorities and maintain systems that allow safety processes to succeed. They arrange group meetings or individual instruction by coordinating with commanders and supervisors. Another aspect of their duties involves conducting safety training programs, evaluating their effectiveness, and conducting briefings and training classes for other trainers. To be eligible for this job, you’ll need a high school diploma or its equivalent, and need to have normal color vision and depth perception A state driver's license is required since you'll be driving government vehicles. You have to have a record free of courts-martial, and no history of unresolved mental illness. If you're claustrophobic or have a fear of heights, this is not the job for you. Recruits in this job must be able to speak clearly and communicate clearly in writing and be able to stand for prolonged periods of time. 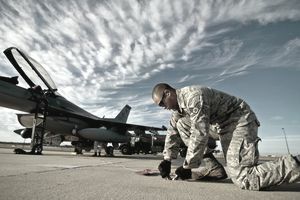 To qualify as an Air Force safety specialist, you'll need a score of 55 on the general aptitude area of the Armed Services Vocational Aptitude Battery (ASVAB) tests. This composite score is derived from your scores in the ASVAB's Word Knowledge, Paragraph Comprehension and Arithmetic Reasoning sub-tests. There's no Department of Defense security clearance required for this job, and U.S. citizenship is not a prerequisite. First, they'll spend 7 1/2 weeks in basic training and complete Airman's Week, then airmen in this job spend 35 days in technical training at Lackland Air Force Base in Texas. Here they'll learn the fundamentals of safety education and mishap prevention, industrial hygiene principles, risk management, and mishap investigation techniques. They'll also learn how to interpret blueprints, how to distribute safety education materials and how to apply automation to safety functions. While there are military-specific duties for this job, you'll be trained in principles that should help you qualify for a job as a safety inspector at places like construction sites or local government buildings. Additional training or licensure may be required depending on the specific job.